Story: Karnage Doesn't Kill Here Anymore! Summary: It was been a long week for the Huntress. In addition to fighting and capturing all of the bad guys that crawled out of the woodwork in Gotham, she also has to deal with the fact that her boyfriend probably wants to break up with her after learning her secret, but is afraid to lay it out that way. If that wasn't bad enough, Richard Grayson--the other man in Helena Wayne's life--also wants to put distance between them to keep himself from thinking naughty thoughts about the woman he once thought of as his baby sister. All of this is flowing through her head when a new Gotham baddie decides to put a target on her back and make a name for himself in her blood. He captures the Huntress off guard not once, but twice! The first time Karnage caught the Huntress off guard, it was just shortly after her boyfriend and Richard decided to put distance between themselves and her. The Huntress was already at a low point emotionally when Karnage first assaulted her, making her feel like she's losing her edge. Now that she is back to resuming her life as Helena Wayne, attorney at law, Karnage catches her off guard yet again, but this time, he isn't after her, he is after her boss, Arthur Cranston. Things just seem to keep getting complicated for the Huntress. Not only is she dealing with a new criminal who might know both of her identities as Helena Wayne and as the Huntress, but she also has to protect both her colleague, Charles Bullock, and her boss from him after busting into her law firm looking for the latter. But how does she do that without outing herself as the Huntress, effectively confirming what she thinks Karnage already knows? Helena waits for the right opportunity to get into gear as the Huntress, but her efforts are wasted when Karnage is no longer inside the building. The Huntress then decides not to take any more chances and steps up her game by doing exactly what her name suggests: do the hunting herself. After tracing every possible supplier for Karnage's dangerous weaponry, she narrows down her list to only one supplier--a man she had already met in a previous encounter: Edgar Stenville! Review: As the second instalment of this 8-part story arc, it's a bit of a hit-and-miss for me...more miss than hit unfortunately. The primary strength of this second chapter lies in Levitz trying to present Helena Wayne with a different type of challenge that she's not accustomed to. Whereas Helena is very confident in her abilities to succeed her father as a detective and as a crimefighter, she's also not used to having enemies who challenge her in a very personal way. In contrast with previous enemies who didn't really pose a threat to Helena either physically or intellectually, Helena's newest enemy has figured out her identity as the Huntress and is clearly using that knowledge to their full advantage to shake her up. Not only are her immediate friends and family in danger under these circumstances, but Helena is also completely caught off guard by this realisation. She not only has to play her cards more carefully now to avoid making the problem worse, but she also doesn't really know how to react appropriately to this particular danger. Levitz did actually plant seeds for an interesting story with this idea. Where Levitz fell short was in the execution, which becomes more obvious as the story progresses. The first thing that went wrong with this second instalment was how quickly the initial conflict was resolved without Helena ever finding out who learnt her identity or why they were after her boss. She seemed rather satisfied with only scaring Edgar Stenville in his own bedroom, and beating up Karnage in his own home. Not only does this make Helena look like a bad superhero by not bothering to follow up on why Karnage was after her boss specifically, or why his employer (whom she knew was Edgar Stenville for that matter) was interested in him. She didn't even revisit her earlier question in this chapter of whether or not Karnage really knew her dual identity, or Stenville for that matter. I realise there was an 8-page limit with this instalment, but that's still something that could've and should've been addressed. On that note, Helena accidentally outed herself on the first page of this instalment when she screamed Karnage's name in her civilian identity, which should've tipped the man off on her identity as the Huntress. 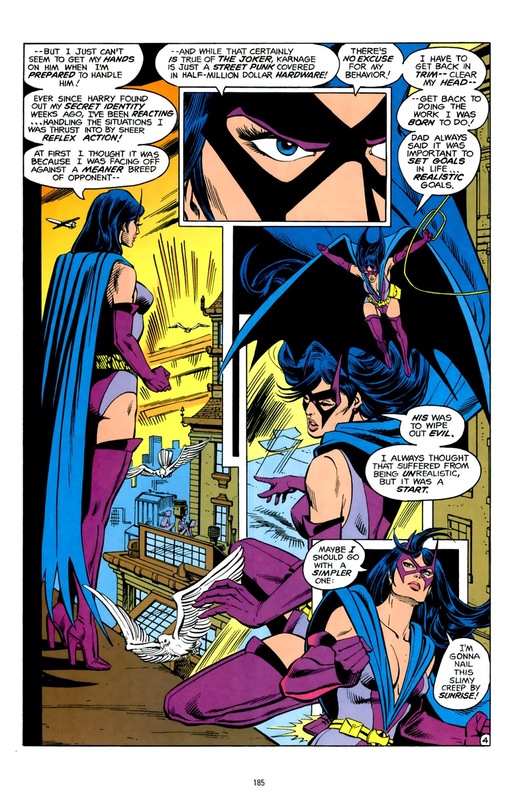 The fact that Levitz went out of his way to establish that Karnage doesn't know Helena's dual identity on that first page, from his point of view, Helena Wayne and the Huntress are two completely separate entities. If a woman he supposedly hasn't met yet already knows his name, that should've immediately resulted in him putting two and two together. The fact that he didn't catch on to the fact makes him look stupid or unaware, which kind of leads to the third problem this instalment suffered from, which we will get to in a minute. The second weakest point of this instalment was the incredibly cliché and ridiculously ham-fisted dialogue even by pre-Crisis standards. For the most part, Levitz was pretty preoccupied with giving Helena 'cool things' to say on the page, which for the most part, felt very out of place for the context in which he used them in. All of the dialogue bubbles that he wasted attempting to make Helena 'sound cool and feisty,' could've been better spent actually developing her thought process and asking the right questions when she was finally in control. The dialogue from the other characters isn't any better. Karnage's threats in particular sound so ludicrous on the page, he reads more like a caricature of a thug than a genuine threat to Helena. That problem coupled with the fact that he is one of three black characters in this story arc intersects with yet another problem that was common in comics during this time (and still is unfortunately), which is the problem with racial stereotyping. Right off the bat, Karnage embodies every negative stereotype of black men in fiction. He is first introduced as a criminal and lacks any other developments that tell us anything useful about who he is, where he comes from, or what he was doing prior to getting hired by Stenville to kill the Huntress. Nothing is even known about his own personal motivations for teaming up with Stenville, or why he cares about killing the Huntress. For all we know, from his point of view, the Huntress is just some strange woman he was hired to kill. Unless Stenville is paying him big money to get the job done, why does he care to kill her? He's very much a blanket character who lacks any real purpose than to be the next thug the Huntress beats up to shows off her badass Dark Knight daughter skills. That's especially problematic when you consider he's not even the main villain in this story--Edgar Stenville is. The fact that he is written as unintelligent and is even given the the appearance of a dangerous thug, complete with a bald head and very big muscles, completes the bad stereotype. In addition to the poor writing of the POC 'baddie of the week,' the overall representation of people of colour in this chapter isn't stellar. 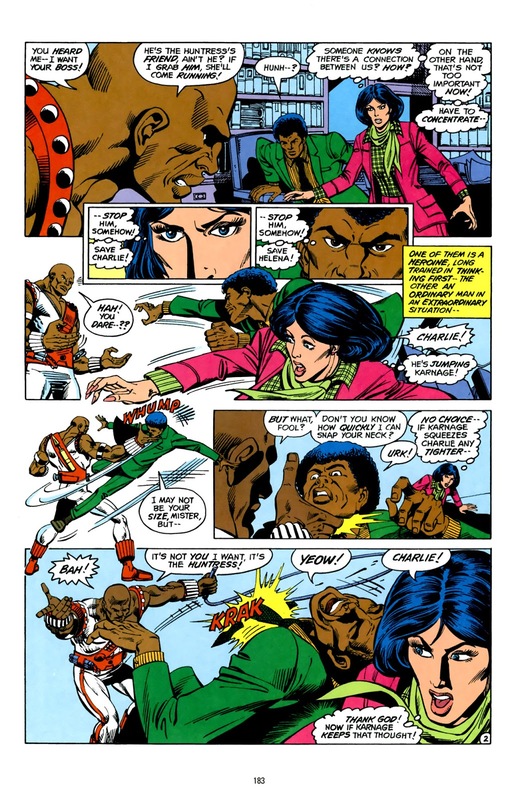 Another character of colour that appears in this chapter, Johnny Three-Card, shares many of the same problems with racial stereotyping as Karnage. 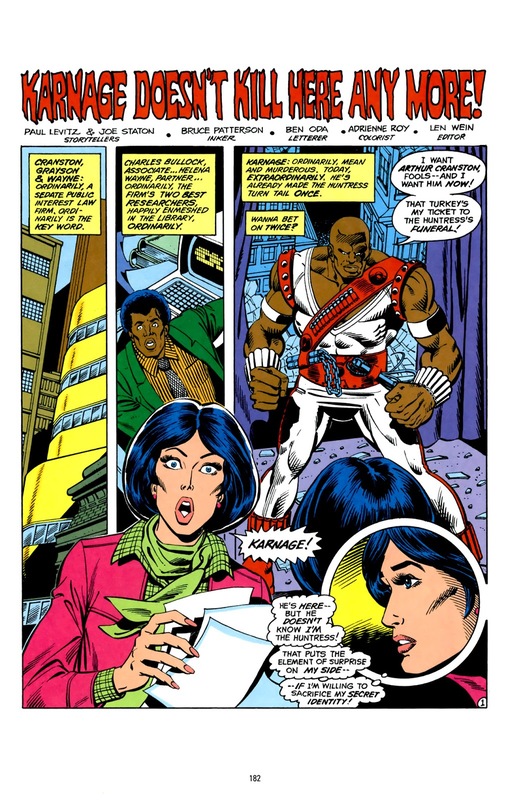 For one, he is implied to be a swindler as evidenced by the fact that he has something of a 'street name' and an accompanying gimmick, and the Huntress threatens him because he apparently knows Karnage. Levitz also makes a point of establishing that this is a crime-ridden corner of Gotham, and Johnny is given an equally poor appearance, as well as a speech pattern that makes him sound uneducated. We are clearly meant to interpret this character as being 'the lowest common denominator'--a problem not helped by the fact that this role is being exclusively given to black male characters. The sole white male villain in this story is established as wealthy and existing as being higher up on the crime ladder. The only saving grace in this chapter on the POC front is Charley Bullock who is at least established as an associate at Helena's law firm, and was seen defending both himself and Helena against Karnage. However, considering that he isn't given much to do following that bit, and is easily taken out of commission in the first three pages, he's more or less a background character in this story, which isn't too progressive on the representation front. Within the overall story arc, this chapter is by far the weakest link. It started off with a promising idea but it was not very well thought out nor carefully executed in this one chapter. With poor writing coupled with racial stereotyping, there's actually enough material here for a Lapses in Logic post rather than a Best of the Huntress review. What ultimately spared this chapter from getting a Lapses in Logic post is the fact that it is part of a larger story arc that is actually better than this one chapter. While individual chapters of a larger story arc have never stopped me from covering them in the past, it's also hard to do these types of posts with 8-page chapters alone without covering the rest the story arc for context.